to a targeted audience every month! 24 Seven is a respected and trusted source for empowering information and resources. The magazine is distributed to more than 500,000 readers each month and its monthly readership has surpassed the one million mark. 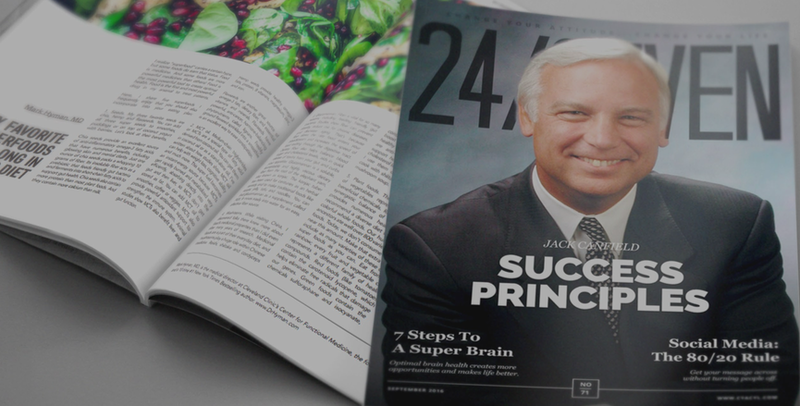 24 Seven readers are people who are interested in living a happy, healthy, productive life. Once published, the magazine is archived for on demand access on the Change Your Attitude … Change Your Life website and other digital newsstands. Each month, nationally recognized experts and leaders in their field provide advice in areas such as health and wellness, self-help, personal finance, spirituality, and business. It is our mission to give readers practical information so they can make informed decisions for themselves and for their loved ones. By partnering with us you are associating your business with a well-respected, reputable organization that is spreading a positive message of hope and inspiration to its vast audience, your potential customers. Use our platform to deliver your message to a targeted group of people that care about what you have to say. Click to read a copy or to learn more about the magazine.